Fairies, Unicorns, mischievous boys, a harp and a mystery. 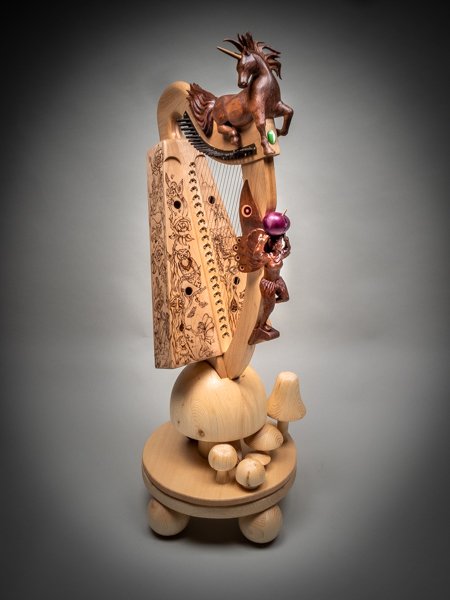 My friend Weldon Gray contacted me to take pictures of a harp that he found in his shop. I was so lucky to be part of this adventure that I wanted to share this amazing story with you. The very next day, as I came to work walking past the garden, nostalgic to relive such an unusual moment, I unlocked the door and walked in and found this beautiful enchanted harp. I can only guess that it is a gift from the unicorns and fairies of the world for doing what they considered an enormous favour. As I studied the harp, I became aware of all the magic that rules the world of unicorns and fairies.